How does this traveller get back into the rhythm of being at home in Toronto? After stopping to smell the flowers, she puts herself down in front of her computer, typing her way through assignments, pitching new stories and doing interviews. I focus on what I need to do as much as what I need to create. But when I’m surrounded by the warm sun of early summer, its hard to stay inside. Its hard to focus on my laptop screen, on social media or on deadlines when I know there’s another lure. For those who know us Canadians, summer is a precious time of the year. Its not as long as we’d like and its not as constant as we would like. So when summer arrives, when patio and balconies and rooftops become the idyllic places to hang out, its hard not to want to be part of the afternoon and post-work ritual. 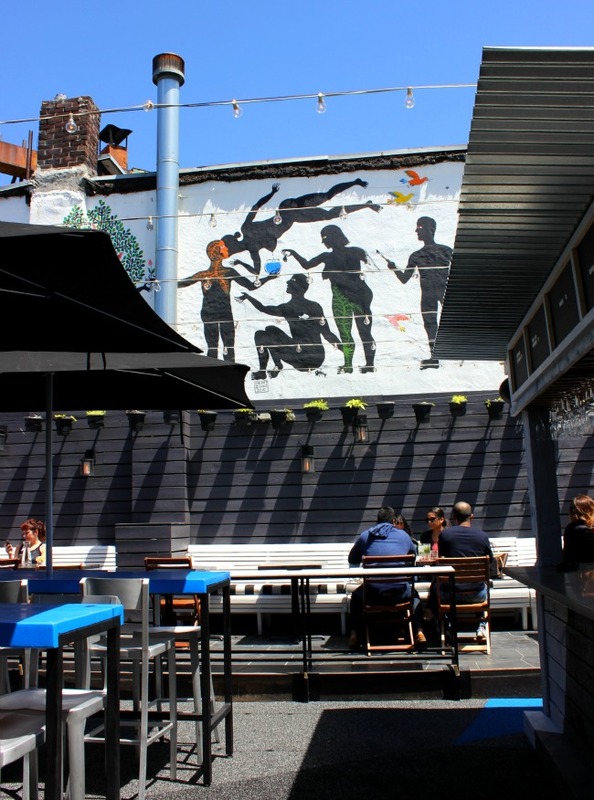 I did escape – to The Drake Sky Yard, with its bright blue table tops and a new mural adorning the old brick wall. I toasted summer with a friend visiting the city, sipping on lavender lemonade. And I realized the best welcome back to Toronto is to celebrate a totally local obsession – being on the patio.